The real tragedy of using medications to control Type 2 diabetes is that it engenders fear. Patients are usually given the scary news that they have an “irreversible and incurable” condition called insulin resistance. Secondly, type 2 diabetes is a “progressive disease.” These messages are presented as if they are clearly understood by experts who, in reality, cannot prove them scientifically. Some people with diabetes also fear its corollary problem, hypoglycemia—abnormally low blood sugar, usually caused by medications such as insulin. This fear often compels them to eat even when they are not hungry, or to eat more than they need to because their medical caregiver told them to do so. Many medical practitioners use fear to encourage diabetic patients to check their blood glucose level daily at home. Their idea is that the more accurately you know your blood sugar level, the better you can control it. However, there are no studies showing that regularly checking your blood sugar level at home results in better long-term maintenance of the blood sugar levels, a lower incidence of hypoglycemia, or fewer complications of Type 2 diabetes. I am opposed to medications to control blood sugar in prediabetics and in people with Type 2 diabetes. My view is that treatment for Type 2 diabetes should be based on achieving beneficial outcomes. These include the reduced risk of having problems related to the heart, eye, kidney and other organs—not any supposed evidence that your blood sugar values have declined. 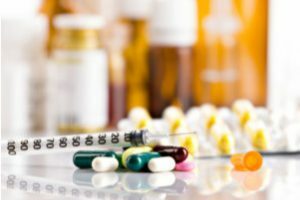 As I said above, many people taking diabetes medications to lower blood sugar still end up with lost eyesight, amputations, kidney disease, or other serious complications. In the end, this means that, if you are seeking to treat diabetes, a reversible condition, it is important to eliminate grains and grain-flour products from your diet. This action reduces the absorption of excess glucose that your body has to store in the form of fat called triglyceride. Because, once your fat cells are full, the body is programmed to burn fatty acids instead of glucose to produce energy, leaving glucose in the blood leading to type 2 diabetes. Avoiding grains and grain-flour products, on the other hand, reduces the accumulation of fatty acids flowing in the bloodstream, so your body can revert to the normal pattern of burning glucose in your muscle cells. You will thus put an end to the fatty acid burn switch, lowering the level of glucose in your blood. If you have been recently diagnosed with Type 2 and would like to be medication & diabetes free, I recommend my new book. Relearn how to eat for health while enjoying your food! Think of the joy you will experience to be able to eat when you are hungry rather than on a schedule, or to be able to skip a meal if you want without having to worry about the serious consequences of hypoglycemia. Avoid the complications caused from keeping up with your medications. 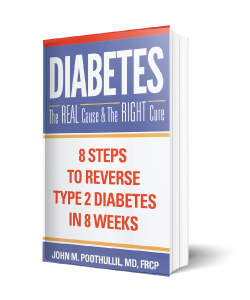 I will show you how your diabetes can be “cured” if you follow the 8 steps in this book.